Jim Grant is Head of Business Development, Cornwall. He manages teams delivering business-facing projects worth over £40 million, and works directly with businesses and other stakeholders helping them to access knowledge and expertise within the University. Jim supports the University’s multi-disciplinary approach to the development of research activities in all aspects of energy technologies and marine technology. He was instrumental in the establishment of the Peninsula Research Institute for Marine Renewable Energy (PRIMaRE) in 2007 and in 2017 led the establishment of Marine-i in Cornwall and the Isles of Scilly as a vehicle for business-led research, development and innovation. He has been a member of the Cornwall & Isles of Scilly LEP's Employment & Skills Board since 2014 representing HE, helping to define higher level skills priorities. He is also a member of the Society for Underwater Technology’s Marine Renewable Energy Committee and the SUT's Education & Training Committee. Prior to joining the University of Exeter, Jim spent ten years in the oil and gas sector, working for a research agency as Technology Transfer Manager which generated over £80 million of industry and Higher Education Institution (HEI) collaborative research and development. He has also set up and ran a European university association in marine technology to work alongside major European shipbuilding and shipping interests, designed to exploit European Union research opportunities. Jim spent seven years working for Plymouth University; in this role he was responsible for knowledge transfer within their marine portfolio. 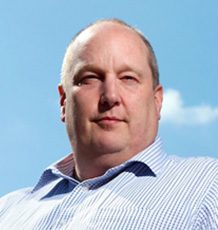 Jim Grant joined the University of Exeter in December 2008.